I enjoy seeing wildlife I hadn't seen before or (often) had seen before but hadn't identified. And new behaviors are even better. Our cabin on Case Inlet, a branch of Puget Sound, is a great spot - being on salt water it has a great variety and it has a 180-degree view. It is so close to the water that I could watch for wildlife when sitting at a window when I required crutches to walk. Actually, I still see things while inside. Two weeks ago I saw a bald eagle catch a fish. Eagles don't dive into the water like ospreys; they only grab fish that are at the surface. He hovered just above the water for about 30 seconds then grabbed one. We also saw a group of marine mammals feeding on the surface. Harbor seals? I don't know: I always see them solitary. Or if not alone separated like neighbors not tight like a team; this was a group of at least 3 or 4 swimming together along the same line. Sea lions? I don't know: They group together like we saw. But they are very noisy. This group was quiet. They were easily spotted by a noisy group of birds seeking scraps to grab. My guess is that it was sea lions who were quiet because they were concentrating on their meal. A few days ago my wife was watching a water foul. I was guessing a loon. But she said he was near a red and white mooring buoy. Such a buoy was out there but he wasn't close to it?? Resolved. The loon's throat was white and a very bright red vertical stripe. Our Peterson's guide showed it to be a red-throated loon in breeding plumage. They breed and nest farther north. But I have seen loons in breeding plumage here before - common loons whose breeding plumage is a spectacular pattern of black and white. 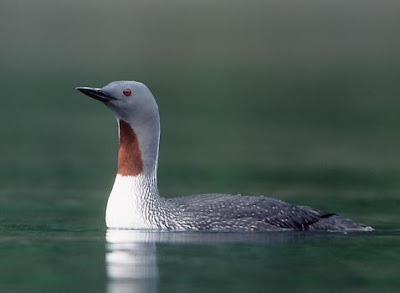 The photo: A red-throated loon at Bird Watching Alaska. Threats by fire fighters and police? How can we get a state budget?